This collection consists of records related to the President’s waiver of the Jackson-Vanik Amendment for Vietnam. The Jackson-Vanik Amendment denies normal trade relations to countries that limit the right of citizens to emigrate. President Clinton granted Vietnam a waiver in 1998 and renewed it 1999 and 2000. This collection contains memoranda, letters, reports, email, and drafts. 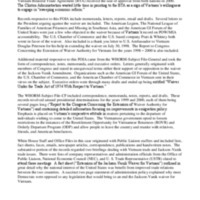 It also includes letters from organizations, such as the U.S. Chamber of Commerce and the American Legion, and from members of Congress presenting their arguments for or against the waiver. The records also contain the Reports to Congress Concerning the Extension of Waiver Authority for Vietnam for the years 1998 through 2000.